Peace upon these Momentary Ordinary Days! Darkness spoke in a hesitant, stuttering manner while holding the cup of tea Megumin brewed for her. Megumin gently asked while stroking Darkness’s head like she was comforting a crying child. Megumin quickly averted her eyes. ーYuiyui ended up spending the night in a dungeon, so no shenanigans happened that night. The first thing Aqua said to Yunyun as she visited in the morning were those words that did nothing to inspire confidence. As Darkness mumbled gloomily, Yunyun gazed around like she was looking for someone. Oh, yeah, another explosion happened in the forest last night. The normally shy and soft-spoken Yunyun strongly objected. With a significant amount of unease in her voice, Yunyun headed off with Aqua for their trial. As we were walking down the street, I came across a strangely familiar young man. Darkness said something really strange upon seeing him. Indeed, the Swordmaster who wields the Magic Blade Gram is standing before me. Mitsurugi hastily grabbed my arm as I tried to leave. From the looks of it, Mitsurugi came here alone without bringing his usual hanger ons. Darkness, who doesn’t know about Aigis, gave Mitsurugi a genuine look of concern. The matters that the divine relics set off to attend to is to see the Crimson Demons that are famous for having a lot of beauties. That fortune teller is very accurate indeed. Just as I was debating whether I should tell him about Aigis or not, Mitsurugi’s face suddenly turned serious. Saying that, he turned around. Leaving behind such dramatic parting words, Mitsurugi left. Darkness slowly blushed as she said all that in one breath. Well, I was more talking about keeping her sexual fetishes hidden and coming off like a regular girl, but I guess it doesn’t matter. Since it’s always sunny out here, the Crimson Demon Village is always perfect for a walk. They’re wasting magic as usual, but the magic of the Crimson Demons is impressive nonetheless. I relayed some local trivia to Darkness when she happily pointed towards the cat. Darkness, who was so elated a short while ago, slowly frowned. Darkness, walking next to me, suddenly turned to face me. I immediately retorted with a sound rebuttal, but it seems like what I just said was the absolute worst possible thing. Darkness looked at me with a doubtful gaze upon hearing that. The two of us turned around, and standing right there was Megumin. In response to our utterly pathetic excuses, Megumin shot us an exasperated look. We didn’t do anything particularly bad, but for some reason, I just couldn’t say anything. Following the strangely chipper Megumin, we ended up taking a walk around the village. After I denied Megumin’s rampant delusion, the other Crimson Demon said. Megumin pounced on him without a word. A flurry of voices shot out as Megumin started rampaging. After getting thrown out of the restaurant, we decided to head back to Megumin’s house for lunch. Megumin ended up attacking all those people who were jeering at her, and after seeing the numerical disadvantage that Megumin had, Darkness and I entered the fray on her side. Megumin let out a small giggle. As we were making our way back to Megumin’s house, a familiar looking girl called out to us. The person who called out to us was a fairly well developed young lady wearing an eyepatch. This troublesome Arue girl pulled upon Megumin’s eyepatch as a form of protest. Arue angrily said, her eye glowing bright red. Megumin stepped in and prevented Arue from grabbing me. Saying that, Darkness extended her hand with a smile. Arue returned with a smile of her own, in complete contrast to the attitude she showed me. Arue said in a nonchalant manner. This girl has quite the tongue on her. Arue’s eyebrows twitched after hearing my words. Aqua came back to Megumin’s home in tears. I asked Aqua as she wailed on all fours. … Looking closely, Aqua seems to be covered in mud. Could that be that event that often appears in Japanese game shows, the one where you get dropped into a pool of mud if you pick the wrong door? Of all things, it had to be a trial that relies on luck. It’s pretty much the absolute worst fit for Aqua. After requesting a surprisingly commoner-sounding dish, we sent Aqua off to the bath. Darkness hesitantly started while sneaking glances at me. Darkness seems strangely conscious about that today. Is it because of this afternoon’s date? After dragging away the soundly sleeping Darkness and whipping up the snacks, Megumin and I retired early. I threw myself onto the bed the moment I entered the room and rolled up and down it. Megumin coldly stared down at me. That’s because I like little sister characters. It’s not because I like little girls. Saying that, Megumin slipped onto the corner of the bed, leaving a fair distance between us. Is she talking about the curse I brought up? I got Aqua to cast Break Spell upon me repeatedly the other day despite her saying that she can’t detect any such curses hanging over me. “How frivolous could the Demon King be? Don’t you feel sorry to pile even more slanderous rumours upon the Demon King? Megumin might say that, but if the Demon King really put such a curse upon me, I would’ve had no qualms about setting off right now to vanquish him. Just then, just as I was thinking about that. I felt something soft grab onto my right hand. It seems like Megumin grabbed onto my hand under the blankets. Megumin shyly smiled at me. She doesn’t get it. She doesn’t get it at all. Megumin fell silent for a moment. While still holding onto my hand, her hand started moving in a pseudo-petting motion, as if she was trying to comfort me. That’s just like her, but I’d really wish she’d spare a thought for my feelings before doing those sort of thing. Megumin said with a smile. It’s almost like she was teasing me. I’m really glad I intervened when I did. And suddenly they brought out a trial that actually felt like one instead of being some kind of prank. At the end of the day, it’d really be best for me to go out there. It’s not like we have any other alternatives. With judicious use of Enemy Detection and Lurk, spending a night in the woods is entirely possible. And it seems like Megumin figured out what I was thinking. Yeah, she’s spending every day in the cells for the sake of her friend. Megumin raised her head from under the blanket. The two of us let go of each other’s hands as we hastily turned away from each other. Perhaps to hide her embarrassment, Megumin ducked beneath the blankets..
Scuffling with the Defense Corps. The members of the Defence Corps were pushed to the limit trying to restrain the high leveled Megumin. I’ve thought this about Darkness too, but I can’t shake the feeling that this party would do better if they just fought with their fists. Darkness mumbled, but it’s clear she isn’t keen on being her partner either. Yunyun seems like she wants to say something, but we are already used to it. More important is the fact that the other two declined to participate. Well, it’s not that much of a surprise, I suppose. Not only is it the infamous Crimson Demon trials, but this is also the toughest one out of all of them. Go ask the Crimson Demons who named him, not me. Yunyun seemed on the verge of tears as she said that. I introduced Yunyun to the dancing and singing divine relic, Aigis. Darkness looks bewildered upon seeing the armour spew out a constant stream of words in front of her. Aqua replied in a slightly vexed manner after I directed the conversation towards her. I really wanted to tell them that they should know each other very well. After triggering Aigis’s weirdo sensor, Aqua started kicking at the suit of armour. Yunyun tilted her head and asked. Aigis is an autonomous artifact. He can stay up all night and would be able to protect her even if they were ambushed. Just then, Darkness gently tugged upon my sleeve. Aigis defiantly declared. Seems like armours have their own sense of pride too. This conversation is starting to seem like some sort of contest. An indignant Darkness joined Aqua in whaling on Aigis. Yunyun, even though she’s blushing from the sexual harassment, stood in front of Aigis with a serious expression. Aqua whispered into my ears after hearing Darkness’s words. Aqua once again whispered to me. Darkness glared at us with tears in her eyes. The final trial is to survive spending a night in the forest where strong monsters make their nest. ーBecoming the chief of the Crimson Demons. For me who never had many ambitions or dreams, that was my only goal. On the day my magic power and intelligence were measured, they praised me and said that I really was the chief’s daughter. That made me really happy. From that point on, aiming to become the chief just felt natural to me. I was walking towards the depths of the forest together with Aigis-san. To guard against sudden attacks from monsters, I’m currently within Aigis-san. The gods created Aigis-san for a very important purpose. What I plan to do after becoming chief. I’m the one who will become the chief of the Crimson Demons. I really didn’t want to hear this from Aigis-san, but yes, Crimson Demons are, as a general rule, a free-spirited bunch. In the past, I had a close friend who was called the number one genius of the Crimson Demons whom everyone had great hopes for. That stupid close friend who ignored everyone’s hopes and expectations, pursued her own dreams, and ended up getting referred to as the idiotic worst mage. I wonder what would’ve happened if Megumin had seriously set her sights on becoming chief. ーOnce this trial is over, this time, I’ll be able to tell my rival that it’s my victory this time. I was able to come this far because I had a friend like you. It’s only because a far stronger person than me is so doggedly pursuing her dreams despite the mockery of everyone. Thank you for being my rivalー! Kazumin full speed ahead! Everytime I think they can’t get any cuter they spring something like this on me gosh. I feel a little bad for Darkness but she’s already like a third wheel at this point haha. I’m also glad Kazuma found a good alternative partner for Yunyun lol. I thought he’d just break his promise for the greater good. Man seems like not even Aigis can avoid being traumatized. That’s 3 for 3! Thanks a ton for this translation!!!! I really like the romance progress of Kazuma and Megumin. I really want Kazuma and Yunyun take the trial together. Honestly, Yunyun is so damn cute!!! I hope that something got wrong and Yunyun has to take the trial again (with Kazuma this time). Sorry, but Yun Yun will do it without Kazuma. I don’t remember Madara Uchiha liking romance this much. Are you really Madara?? I wanna ship YunYun and Megumin now after reading this. He said the *F* word to Yunyun, he really fucked up now…. Poor darkness, she still thinks that she can win the kazuma bowl. I’m still hoping for this to happen. What happened to the Kazuma firmly against being a lolicon? Police! I have something to report! So, the implication that Aegis is going to take a bunch of shots from One-Shot Bears all night, delicious! Kazuma’s curse is not a curse that even goddess can remove. Yes, it’s the protagonist curse. As long as he’s the MC, that curse will never be dispelled. Does that mean it’ll be dispelled in the Vanir or Dust Spinoff? Thanks for the chapter. I feel bad for darkness but kazumin ship is too cute and loving to not pair them now. I was expecting kazuma to wear aigis for the trial. Since hes a suit of armor hes just a piece of equipment and would be legal to use. 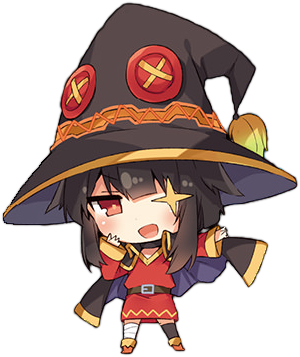 It made me really think what will happen if megumin really become the strongest arch mage? Ok lets make a serious konosuba spinoff. The “What-if” version! Can’t say I much like the distance the author is putting between Yunyun and Kazuma. Meh, I kinda wanted Kazuma to go with Yunyun and maybe develop the third possible ship in the whole series. You’re off by two years. Well, she’s almost 15, but definitely not 16.